by Simon Delott at August 30, 2017 2:32 pm . 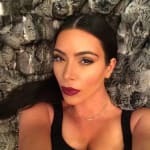 Say what you will about Kim Kardashian -- whether it's about accusations that she and her sisters built their branding empire on the backs of appropriated black culture or maybe you just don't care for her feuding. But we can all agree about one thing: Kim Kardashian loves her children. Oh, and North West is super adorable. And you'll see those two combined in this video of North singing to her mom. Kim Kardashian shared this video on Snapchat earlier this week. It's a strangely relatable moment for the wealthy celebrity as her young daughter sings to her affectionately. North West turned four last June, so she is old enough to remember lyrics to songs and be adorable but also an age where shyness and performance anxiety are pretty normal. But she's happily singing to her mom and, honestly, it's just such a precious video. The video, in which North sings "You Are So Beautiful To Me" to Kim gets a little bittersweet when you notice North's shirt, which memorializes Aaliyah -- who passed before her time. This came right on the back of North West's first-ever interview. Kim Kardashian's more-than-questionable Jackie Kennedy photoshoot wasn't North's idea, obviously, even though North was part of it. North also got to field some questions for Interview magazine, though, but they weren't of the "gotcha" variety. Instead, they came from people like North's cousin, Penelope Disick, who is only 5 years old. Another came from Kaia Gerber, who captures the shocking beauty of her mother (Cindy Crawford) at the age of 15 and who also knows exactly what it's like to grow up with some very famous parents. Sean and Jaden Federline, Britney Spears' sons, also presented North with questions. So did Millie Bobbie Brown, though we certainly hope that North hasn't watched Stranger Things. So, yeah, the North interview might not be hard-hitting journalism or whatever, but it's a sweet idea and good practice for North as she gets older. Whether North pursues being a celebrity or not, she is one, by virtue of both of her parents. Interviews go with the territory, even though they're certainly not standard fare for non-celebrity four-year-olds. Seeing North sing to her mom gives us a glimpse into the much more normal day-to-day life of North and Kim. And in a lot of ways, it could be a glimpse into any house in America. Snapchat's for more than just finding out what music Kylie's listening to in the car or getting nudes from a former coworker or proving that you've never done coke. Anyway, here's the video. Watch now North gets camera shy at the end! She's so sweet!